I know the toilet is everyone's favorite cleaning chore! Here is how to do the job without using irritating, toxic products like chlorine bleach. spray cleaner. 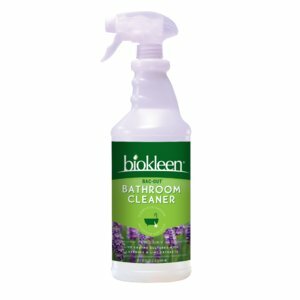 I recommend mixing your own cleaner made with antiseptic essential oils or buying something like Biokleen Bac-Out Bathroom Cleaner or Seventh Generation Disinfecting Bathroom cleaner. Bon Ami powder cleanser. If you can't find this, use baking soda or Borax. Use a bit of toilet paper to wipe up any hair or dust from toilet surface, including the base. With the lid closed, spray entire outside of toilet with cleaner. Then lift the lid and the seat. Be sure to also spray the floor near the toilet base, especially if you live with a guy! Squirt a bit of liquid soap or detergent in toilet bowl. 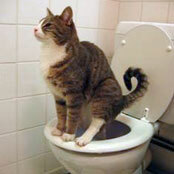 Spray the rim of the toilet bowl, then the underside of the seat. Put that down, spray the top of the seat. Then spray the inside of the lid. Close the lid. Go do something for 10 minutes. This is a good time to clean bathroom mirrors, shelves, or the inside of the medicine cabinet. Lift toilet seat. Sprinkle Bon Ami above the water. Scrub entire bowl with toilet brush. starting with a bit of dry brushing above the waterline, then scrubbing the entire bowl. Leave brush in the toilet and flush. Tap brush dry and return it to its caddy. Close toilet lid. Using a paper towel, wipe down the entire outside of the toilet, starting with the reservoir lid and working your way down to each part of the seat, then the bowl rim, the base of the toilet, and the floor. *I feel like paper towels exist for toilet cleaning. You can compost them afterwards. Obviously, you can also use a cloth and just launder it really well. If your toilet bowl is really stained, you could follow the lead of Sarah at Naturally Domestic blog and make a toilet bowl volcano with baking soda and vinegar. She also discusses the use of pumice stone, which I also hear from professional apartment cleaners is really useful for scrubbing toilet bowls.